Fine Gael got lucky on a number of accounts at the May 23rd elections. First of all, they emerged as the largest party in terms of seat levels at the European elections, even though the party just won 22.3% of the national vote at these contests, due in large part to the vagaries of the PR-STV electoral system and the radical changes made to election boundaries outside of the Dublin region. Secondly, the successes in the European contests, as well as in the Longford-Westmeath by-election, distracted from the party’s poor results at the City and County Council elections, while the extent of the Labour Party losses at these elections draw most of the media focus despite the fact that Fine Gael lost more seats in the local elections than Labour did. Fine Gael won 369,120 votes at the European elections. This was down significantly on the 532,889 votes won by the party (29.1% of the national vote) at the 2009 contests. But the party still won the same number of seats as in 2009 (four seats) – in fact the proportion of seats won by the party was actually up slightly given that there was one less European Parliament seat being contested at the 2014 elections. The party’s vote patterns at these contests did match up well to the new constituency units. Fine Gael would have struggled to win a seat had the old North-West three-seat constituency still been in place in 2014 (against competition from Matt Carthy, Luke Ming Flanagan, Marian Harkin and Pat The Cope Gallagher), but the 20.4% vote share won by the party in the new Midlands-North-West four seaters was just about sufficient to ensure a seat for the party there. The addition of the North Leinster area, with Mairead McGuiness’s large personal support base, helped paper over the cracks for the party’s declining fortunes in Connacht-Ulster, as will be noted later. With 15.5% of the vote, Brian Hayes fared less well in Dublin than had been predicted, but he still managed to narrowly edge out Eamonn Ryan for one of the last two seats in this constituency. Fianna Fail vote management, or lack of the same, in addition to a less intensive level of competition as compared to the other constituencies, saw Fine Gael translate a 27.8% share of the vote (a significantly lower vote share than Fianna Fail’s 32.0%) into two of the four seats in the South constituency. 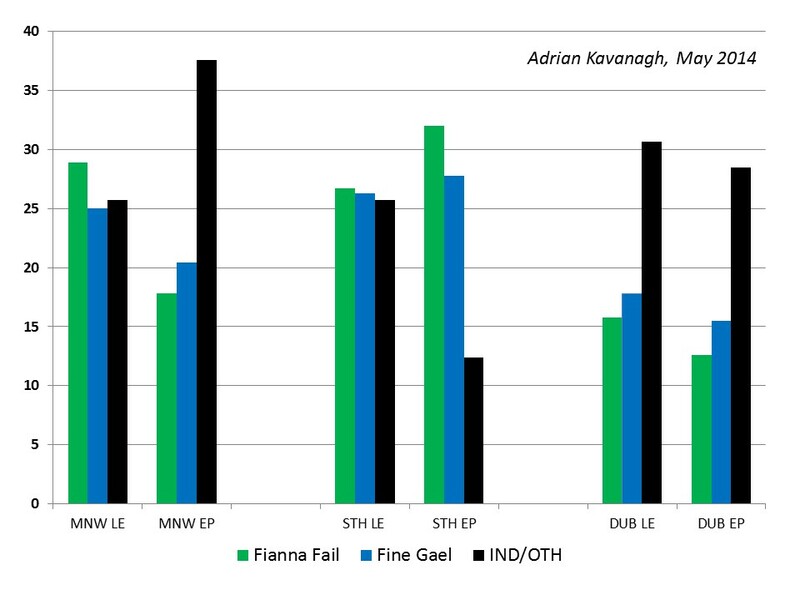 Figure 2: Votes (%) for Fianna Fail, Fine Gael and Independents/Others by region for both the 2014 Local Elections and 2014 European Elections. The party actually won a larger share of the vote nationally at the Local Elections contests (and in each of the European Parliament constituency areas, as Figure 2 shows). In these elections, Fine Gael won 408,246 votes, or 24.0% of the total valid votes cast within the Republic of Ireland. This, however, was down by an even greater degree (relative to the changing support levels associated with the European contests of 2009 and 2014) on the 2009 City and County Council elections, at which Fine Gael had won 605,335 votes or 32.2% of the national (valid) poll. Fine Gael won 235 seats at these elections (24.8% of all seats), which was down significantly on the 340 seats (38.5% of all seats) won by the party at the 2009 City and County Council elections. More than one hundred seats were lost by Fine Gael at these elections, despite the overall number of City and County Council seats having increased from 883 to 949 between the 2009 and 2014 contests. Fine Gael lost 5 seats in Dublin (down from 37 to 32) and 24 seats in Leinster (down from 105 to 81) in these contests. But these losses paled by comparison with the extent of the losses in the other regions. 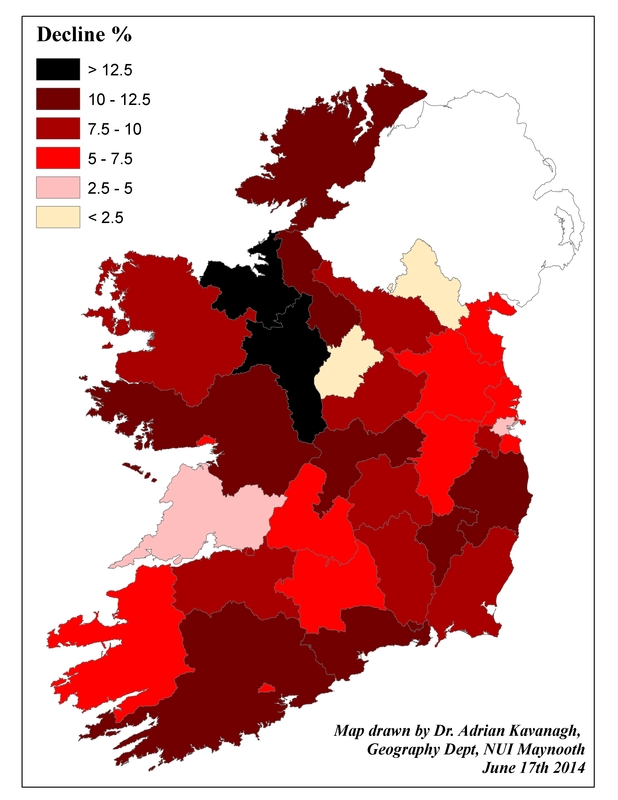 Fine Gael lost 38 seats in Munster (down from 106 seat to 68) and also lost the same number of seats (38) in Connacht-Ulster (down from 92 to 54), but the extent of the losses in the latter region proved even more dramatic given that Fine Gael were starting from a lower base here. 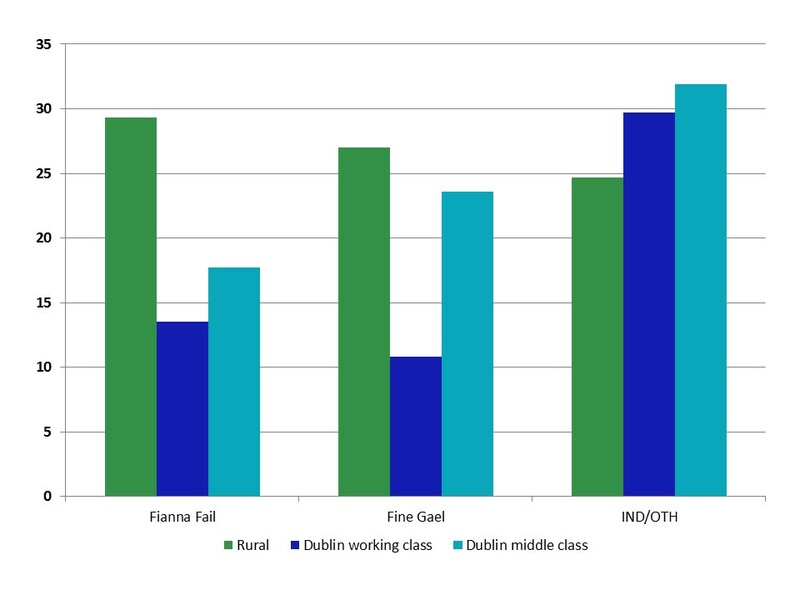 Fine Gael still fared better in the more rural parts of the state than in the more urban areas, as Figure 3 shows. Fine Gael won 17.7% of the first preference votes in Dublin; a significantly lower vote share than in the other regions (Leinster (24.3%), Munster (26.8%) and Connacht-Ulster (26.0%)). Within the more urban areas, Fine Gael were still relatively strong in the more middle class areas, but the party’s traditionally weak levels of support in the more working class area was yet again evident. Fine Gael won, roughly, two-and-a-half times the number of votes in middle class Dublin areas than they won in the more working class Dublin areas. At the county/local authority level (see Figure 1 above), Fine Gael’s strongest electoral performance came in Longford, where the party won 42.1% of the total valid poll – this was the only county where Fine Gael succeeded in winning more than forty percent of the total valid poll at the 2014 elections. The party won between thirty and forty percent of the vote in a number of other counties, however, including Cavan (36.8%), Mayo (34.5%), Limerick (32.7%), Clare (31.5%), Laois (30.2%) and Kilkenny (30.0%). The party’s weakest electoral performances at the local authority level was associated with Dublin City (14.0%) and Fingal (14.7%), while Fine Gael also fell below twenty percent of the total valid poll in Donegal (15.7%), Galway City (15.8%), Offaly (17.3%), South Dublin County (18.0%), Cork City (19.0%) and Wexford (19.8%). The party share of the vote fell by more than ten percent between 2009 and 2014 in ten local authority areas (see Figure 4). This biggest drop was associated with the counties of Roscommon and Sligo, with Fine Gael’s share of the vote falling by 14.4% in both of these counties. The Fine Gael share of the local election vote also fell notably in Carlow (12.3%), Cork County (12.1%), Leitrim (11.5%), Donegal (11.4%), Waterford (11.3%), Wicklow (11.3%), Galway County (10.9%) and Offaly (10.4%). By contrast, the party share of the vote only fell slightly in Monaghan (0.2%) and Longofrd (0.5%). While Fine Gael won 16 seats in Cork County, 13 seats in Meath, 12 seats in Galway County and Limerick and 11 seats in Dun Laoghaire-Rathdown, the party only won 3 seats in Offaly, Roscommon and Sligo. At the constituency or electoral area level, Fine Gael’s strongest performance came in Granard in Co. Longford, where the party won 47.7% of the total valid poll. 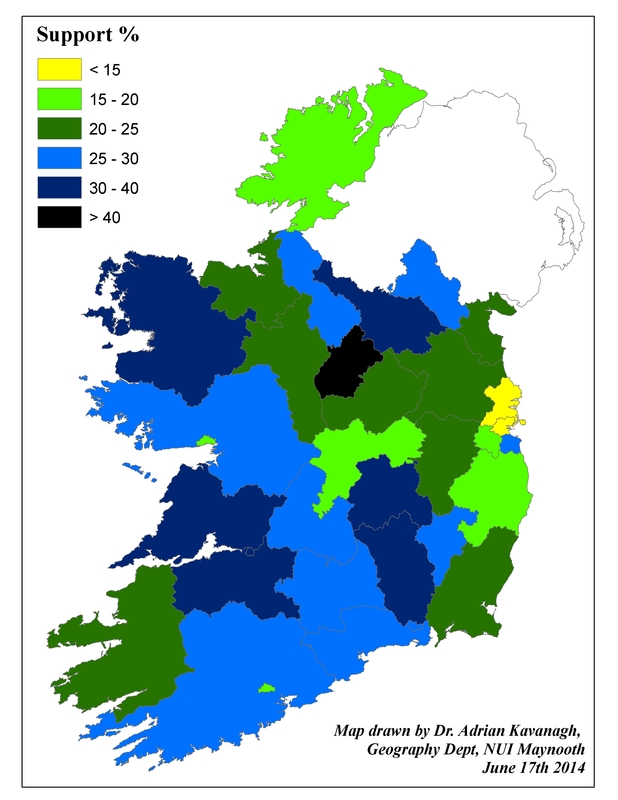 The party won more than forty percent of the vote in seven other electoral areas at the 2014 elections, with these being Ballyjamesduff (47.2%), Newcastlewest (46.9%), Ballymahon (44.0%), Cashel-Tipperary (43.7%), Claremorris (41.3%), Ballybay-Clones (40.2%) and Stillorgan (40.0%). Fine Gael’s weakest electoral performance at these local elections came in Ballyfermot-Drimnagh, where the party only won 5.8% of the total valid poll. This was one of ten different electoral areas (with most of these being located in the more urban parts of the state) in which Fine Gael failed to win more than ten percent of the votes. The others were Cabra-Finglas (6.1%), Tallaght South (7.2%), Swords (7.2%), Crumlin-Kimmage (7.6%), North Inner City (8.1%), Cork City South Central (8.4%), Cork City North Central (9.0%), Cork City North West (9.6%) and Celbridge-Leixlip (9.9%). If these results were to be largely replicated at the next general election contest, Fine Gael would face a huge challenge to retain its seats in constituencies such as Dublin South Central, Dublin Central and Cork North-Central. Finally, the party’s performance in the Longford-Westmeath by-election amounted to another success for the party that helped paper over the cracks of a highly disappointing series of local election results. Here, Gabrielle McFadden comfortably retained the seat won by her late sister, Nicky, at the 2011 General Election with a 25.2% share of the first preference votes. This was down somewhat on the party’s 38.0% vote share in Longford-Westmeath in 2011 however, and the party will be wary especially in relation to the threat posed by the increased level of support for Sinn Fein and Independents there. In Dublin West, Eamonn Coghlan (with 12.8% of the total valid poll there) was never in contention for the seat and finished in fifth place out of the ten different candidates contesting that constituency. While the European election successes and the Longford-Westmeath victory took the “bad look” off things, it is worth remembering that Fine Gael lost roughly thirty percent of it seat levels at the 2014 City and County Council elections. A similar set of results would results at the next general would result in massive seat losses and more than likely see Fianna Fail regain its position of the largest party in the state. If Fine Gael wants to realise their ambitions of leading the next government, then a significant recovery in support levels is required over the next 12-15 months. The recovery in party fortunes must start and start soon. This entry was posted in Local Elections 2014 and tagged 2014, Fine Gael. Bookmark the permalink.